Auschwitz survivor, Bielecki escaped to freedom with Cyla Cybulska in 1944. He became Head of postwar Christian Association of the Auschwitz Families. 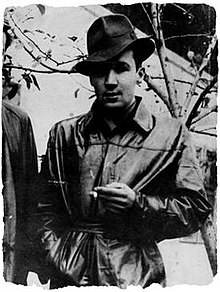 Jerzy Bielecki (28 March 1921 – 20 October 2011, Nowy Targ) was a Polish Catholic social worker, best known as one of the few inmates of the Auschwitz concentration camp who managed to escape successfully. With the help of other resistance members in the camp, he escaped in 1944 together with his Jewish girlfriend, who was an inmate of Auschwitz II. In 1985 Bielecki received the Righteous Among the Nations award. He also co-founded and headed the postwar Christian Association of the Auschwitz Families. Bielecki was born in 1921 in Słaboszów, Poland. A pupil at a gymnasium in Kraków, at the outbreak of World War II he decided to join the Polish Army in the West. While crossing the border with Hungary on 7 May 1940, en route to trying to join up with the Polish Army stationed in France, he was caught and arrested by the Gestapo on the false suspicion that he was a resistance fighter. A month later, on 14 June 1940, he was sent to the newly created Auschwitz concentration camp with the first transport of 728 Polish political prisoners. (His concentration camp number is 243). His decent knowledge of the German language allowed him to work, among other jobs at various times, at a mill (grain) warehouse in Babice (future subcamp of Auschwitz, German: Wirtschaftshof Babitz) as a clerk, where he had occasional access to additional food and came in contact with the Polish anti-Nazi resistance, the Home Army. Assigned to an Arbeitskommando at Auschwitz, Bielecki met Cyla Cybulska at a grain warehouse, serving with the women repairing burlap sacks. She was a Jewish inmate of Auschwitz-Birkenau (Auschwitz II) since 19 January 1943, (concentration camp number 29558) deported from the ghetto in Zambrów. Despite the fact that men and women were not allowed to talk to each other, the two managed to exchange a few words every day, and they fell in love. Cyla's family had already been murdered. Bielecki promised that they both would survive the ordeal. With time, he secretly collected the necessary supplies for an escape. On 21 July 1944 they managed to cross the camp's gate together using a faked green pass, prepared by Bielecki. He was dressed in an SS uniform, assembled from parts of German uniforms bearing the Rottenführer insignia, stolen by Tadeusz Srogi (concentration camp number 178, a friend he made during transport to the camp), who had also supplied the form for the pass. At various points along the journey, Cyla wanted to give up, but Bielecki coaxed and supported her through it, and promised that they both would survive the ordeal. Jerzy and Cyla walked through the fields for ten days. Cybulska was initially hidden at Bielecki's uncle's house at Przemęczany, where Bielecki's mother also lived, and later by his friends, the Czernik family, in a nearby Gruszów village. They treated her like their own daughter. Bielecki himself joined the Home Army. Towards the end of the war he and Cyla separated; Bielecki went into hiding in Krakow, hoping to improve their chances against being recaptured, and they planned to reunite after the war. Cyla was informed that he had been killed during Operation Tempest, while he was told she had left the country and died in Sweden. It was not until May 1983, in New York, that Cybulska accidentally learned that Bielecki was alive and well, when a Polish woman cleaning her family's apartment mentioned a documentary in which she had seen them recount his story. Cyla acquired his phone number, and the couple met the following month in Poland, on 8 June 1983, for the first time since the war ended. Note: According to tombstone photo featured at Findagrave.com, Cyla Zacharowicz (spelled Zacharowitz by Ścisłowska) died in 2005, not in 2002. After the war, Bielecki co-founded and became the honorary chairman of the Christian Association of the Auschwitz Families. He was also inscribed on the list of the Righteous Among the Nations (in 1985), and became an honorary citizen of Israel. Cyla died in 2005. He died in Nowy Targ on 20 October 2011. His escape from the camp with Cybulska was described in a number of documentaries and books, including Bielecki's own autobiography, Kto ratuje jedno życie... (He who saves one life...) (1990). ^ a b c d e f g h i j PAP (2011). "Zmarł Jerzy Bielecki, były więzień Auschwitz z pierwszego transportu" [Jerzy Bielecki, former inmate of Auschwitz from the first transport, died]. Gazeta Wyborcza (in Polish) (2011-10–20). Archived from the original on October 22, 2011. Retrieved 2015-08-15. ^ Polish Press Agency (15 June 2005). "Former Prisoners Pay Tribute to Auschwitz Victims". News 2005. Memorial and Museum, Auschwitz-Birkenau. Archived from the original on 21 May 2011. Retrieved 20 October 2011. ^ Scislowska, Monika (October 22, 2011). "Obituaries: Jerzy Bielecki, hero who fled Auschwitz". Newsday. ^ a b c d e f Monika Scislowska (July 24, 2010). "Poland (Associated Press)". The Dallas Morning News. ^ "Wy Psy (Eng.You Dogs)". JerzyBielecki.com (in Polish). ^ a b Publication. "Jerzy Bielecki. Kto ratuje jedno życie..." [He who saves a single life]. Państwowe Muzeum Auschwitz-Birkenau w Oświęcimiu. Archived from the original on March 20, 2014. Retrieved 2014-03-20 – via Internet Archive. ^ Andrzej Dobrowolski. ""New York Times" o Jerzym Bieleckim i obozowej miłości". Nowy Dziennik. Retrieved 2014-03-20. ^ "Cyla Cybulska". JerzyBielecki.com (in Polish). ^ "Nadszedł czas ucieczki (Eng. It's time to escape)". JerzyBielecki.com (in Polish). ^ a b "W Birkenau szalała śmierć (Eng. In Birkenau death he raged)". JerzyBielecki.com (in Polish). ^ "Poza obozem (Eng. Outside the camp)". JerzyBielecki.com (in Polish). ^ a b Stanley Stahl. "Jerzy Bielecki: A story of moral courage" (PDF). New York: Jewish Foundation for the Righteous JFR.org. Archived from the original (PDF) on April 4, 2012. Retrieved 14 August 2015 – via Internet Archive. They walked for ten nights, hiding in the fields during the day. Cyla and Jerzy eventually reached the home of one of Jerzy’s relatives. ^ a b c "Jerzy Bielecki - Flickers of Light". Yadvashem.org. Retrieved 2011-10-20. ^ Yisrael Gutman; Michael Berenbaum (1998). Anatomy of the Auschwitz death camp. Indiana University Press. p. 509. ISBN 978-0-253-20884-2. ^ a b FindGrave.com, Cyla Zacharowicz a.k.a. Zacharowitz. Inscription on the tombstone of Zacharowicz, Cyla (wife of David) informs that she was born December 24, 1920 and died on February 5, 2005. The engraving reads: "Beloved Wife. Devoted Mother. Special Bubbe." Source: FindGrave.com. ^ Kto ratuje jedno życie; pamiętnik z Oświęcimia (Google Books). Warsaw: Ludowa Spółdzielnia Wydawnicza. 1990. p. 333. ISBN 83-205-4240-5. Retrieved 2011-10-20. This page was last edited on 5 January 2019, at 14:04 (UTC).